You’ve got a new job offer across the country and you are planning to pack your things, buy a home and make the big move. However, when you tell your 17 year old daughter your plans, she lets out a mournful wail and cries that it is not fair. How can you possibly take her away from all of her friends, her favorite hangout spots and the cute boy she just started seeing? 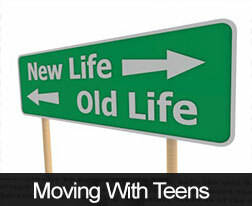 Moving is a difficult transition and it is often even more traumatic for teenagers. The teenage years are an important stage where young adults establish their individuality and independence and during this time their social circle is extremely important to them. Being removed from that against their will can make any teen feel sad, confused, angry and resentful. Also, fitting into a new social scene in a different location can be a challenge for a teen that might be singled out as the “new kid”. How can you help your teen during this transition so that the experience will be easier on them? Give them as much notice as possible so that they have time to adjust to the idea of moving. They will feel like they have enough time to say goodbye to their friends and close a chapter of their lives. Try to schedule the move around the school calendar, as moving in the summer is much less disruptive to your teen’s life than relocating in the middle of the school year. Make sure that they have ample time to spend with their close friends before they leave and once you arrive, understand that they might go through a grieving process of missing their old pals. When you get to your new home, make sure that your teen has plenty of ways to keep in touch with their old friends, such as an internet connection and a cell phone plan. Encourage your teen to get involved in the community of your new hometown, like joining sports clubs or attending events. This can help them to make new friends. Moving to a new town is always exciting but offers challenges like this one for families. For more advice on moving to a new Maine home, contact your trusted mortgage professional today.